Rhonda joined Grasshoppers when Master Power opened the doors in Dartmouth in 2006. Her main goals for joining were for a form of exercise and self defense. She never dreamed that TaeKwonDo could be more than a form of exercise. Now it has become a huge part of her life and couldn’t imagine not training to improve herself both physically and mentally. Grasshoppers is not just a TaeKwonDo School but also a family. It is always growing and it is great to see so many people enjoy everything that the school has to offer. It makes it worthwhile to continue training and to help train all the students in any way that you can. Rhonda can be found assisting all the new students as she is the Member Services Manager at Grasshoppers and does an excellent job keeping everyone up to date. Rhonda is the members services manager for Grasshoppers and responsible for the enrolment and retention of students. 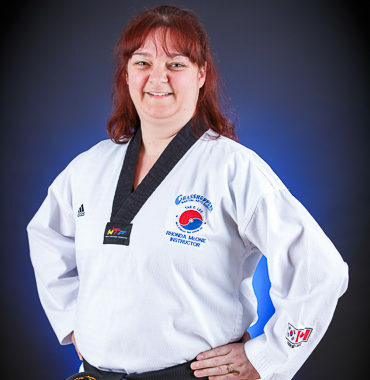 Rhonda is a 2nd Degree WTF Black Beltand Provincial Poomsae and Board Breaking judge. Rhonda is employed by Nova Scotia Health Authority, Central Zone, as a Chief Biomedical Engineering Technologist.